5 cups spinach leaves, add to pot of boiling water, stir for one minute and drain. Makes about one cup cooked spinach. Can use frozen, thawed and drained. Preheat oven to 365° F (190° C). Lightly grease a 6x10-inch glass baking dish. 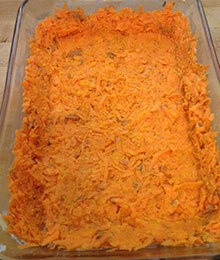 Mix sweet potatoes and butter together in a bowl; evenly spread into the bottom of the prepared dish. 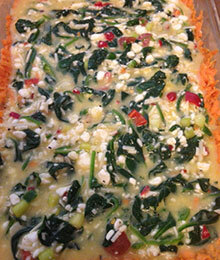 Stir cheese blend, onion, spinach, cottage cheese, eggs, and peppers in a large bowl; spoon into sweet potato layer. 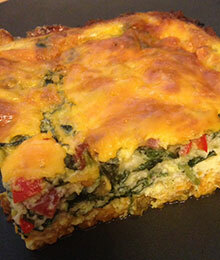 Bake casserole in the preheated oven until a toothpick inserted in the center comes out clean and eggs are set, about 40 minutes. Cool 5 minutes before serving. Optional: Can add precooked chopped natural beef sausage or add thin slices to top before baking.